An attraction at Makaranga is the garden. Guests are able to make their way down winding paths to an oasis of peace and serenity. There are 18 ponds including Venus Pond and Long Pond, the latter being the largest waterway in Makaranga. For a true respite or soul searching, there is also a one kilometre long labyrinth set in a quiet corner of the gardens. Makaranga is home to many beautiful statues in stone, bronze and marble that have been imported from Italy and Zimbabwe for your enjoyment. These include a wonderful hand carved reproduction of Michelangelo’s “David”, as well as the “Four Maidens”, who each carry the foliage of their respective seasons. 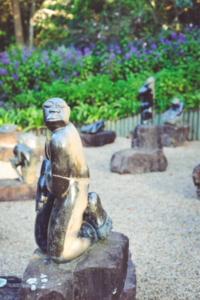 These graceful statues keep a watchful eye over the “Blue Pond”, so named because of the bias towards different shades of blue and purple plant material. 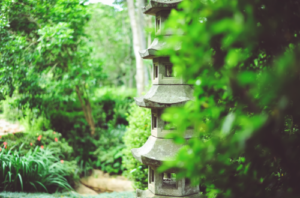 The authentic Japanese Garden boasts original bridges, walkways, stone lanterns and hand carved figures, all imported from Japan and set out according to ancient traditions. The ponds create a sense of stillness and calm, while the exquisite water lilies proudly display their pinks and purples. 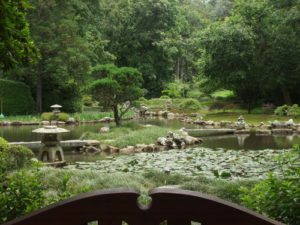 The Japanese Garden promises a sense of awe, wonder and peace. Throughout the garden you will discover an impressive variety of both indigenous and exotic trees. Makaranga is home to many rare and exotic species of Orchid, Camellia and Rhododendron. For the avid bird watcher Makaranga offers an ideal setting for the casual outing. Whether your interest is botanical, photography, pleasure or if you are simply in need of some soul restoration, the garden is sure to satisfy you. The Deli staff will assist you in constructing your picnic basket or you may select our off-the-shelf meat or vegetarian options. Picnic blankets and baskets are for hire and the garden offers abundant grasslands and some picnic chairs and tables for you to choose from. Guests are not permitted to bring in their own picnic baskets. Children under the age of 16 require adult supervision at all times. Golf carts for the mobility impaired can be pre-booked at a nominal fee. Photographers who would like to make use of the gardens, please enquire for the applicable fees.